Slide Kamera HSK-6 800 PRO is a professional equipment perfect for smooth shots during the camera movement. 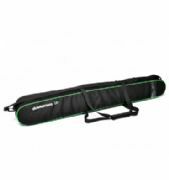 Suitable for camcorders (up to 15kg) and cameras. Deliberately deisgned cart moves on a rail carrying the camera in front of the object that is being filmed. 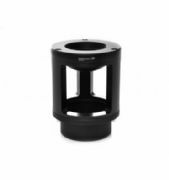 The cart is equipped with a 3/8” threaded hole appropriate for screwing AF-12SL reduction 3/8” mandrel or alternatively AF-11SL 1/4" - 3/8" mandrel in order to mount a camera head, camcorder or a camera. There are eight M4 threaded holes on the plate of the cart to mount Slide Kamera AKC-3 adapter or any other Manfrotto adapter. 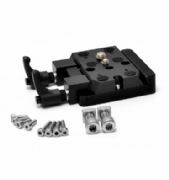 AF-3-HSK Slide Kamera PRO Feet are compatible with all Slide Kamera HSK Series models. Jointed aluminum construction of feet provides a stable mounting of the slider on various surfaces. Feet are equipped with 3/8 " holes which allow to mount the slider on two tripods or monopods. 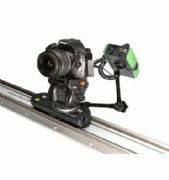 Thanks to that you can achieve high rigidity and reliable mounting of the slider. Additionally, AF-3-S PRO Feet protect the cart from falling out of the rail. The drive is meant to performance very fluent shots in movement from 5,5cm/s to 20cm/s, and the photos of (time-lapse) type. Trolley is fuelled by means of direct current motor which is connected to the controller. The drive is meant to performance very fluent shots in movement from 5,5cm/s to 20cm/s, and the photos of (time-lapse) type. Trolley is fuelled by means of direct current motor which is connected to the controller. The drive power supply is possible from power pack or three accumulators R6/AA. Video mode - This cog, as the name shows, is meant to performance fluent camcorder shots or camera placed on Slider’s carriageable trolley. Control direction and shift speed takes place via SPEED knob. Loop mode - Mode “Loop” in common with mode “Video”, is meant to performance fluent camcorder shots or camera placed on Slider’s carriageable trolley. In this mode, when the drive finds too much resistance, automatically starts go in the opposite direction. Pulse mode(time-lapse) - In “Pulse” mode energy is delivered to the engine in the form of impulses of set/desired power (from 1 to 5). Selecting the direction of motion and the time which the impulse will be asked it’s carried out using the “SPEED” knob. Pulse mode(time-lapse) - In “Pulse” mode energy is delivered to the engine in the form of impulses of set/desired power (from 1 to 5). Selecting the direction of motion and the time which the impulse will be asked it’s carried out using the “SPEED” knob. In the PRO version, thanks to a cable that is connected between the controller and the camera, the drive controller itself releases the shutter when the truck does not move. If you do not have the PRO version you can use for example an external drain hose from the interval timer function. In version HDN-2 PRO through cable (WS-1, WS-2, WS-3, WS-4, WS-5, WS-6), which connects the driver to the camera, the controller releases the shutter drive itself at a time when the truck does not move. If you do not have the PRO version you can use for example an external drain hose from the interval timer function. Approximate number of shots (jumping) during the passage of the truck at the Slider. Approximate journey time interval equal to the trolley for 1s. The drive is designed to perform scenes in motion and sequential. Trolley is driven by a stepper motor connected to the controller. The drive is designed for sequential as well as in motion shots. The cart is driven by a stepper motor connected to the controller. Programming, controlling and configuration are possible with a use of joystick. Simple and functional menu provides the ergonomics of service. Additionally, the controller, apart from the joystick, is supplied with two knobs. One to adjust the speed range, and the other to control smoothness of motion, i.e. 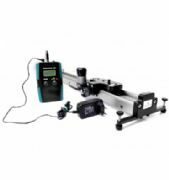 we set certain acceleration thanks to which it possible to achieve the desired speed very smoothly. The drive is designed for sequential as well as in motion shots. The cart is driven by a stepper motor connected to the controller. The controller is equipped with several working modes described below. 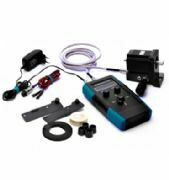 It also enables to control the photo camera (take photos) through a connector and a cable dedicated to a certain type of camera (the cable is an additional accessory). The drive can be mounted on Slide Kamera HSK-5 and HSK-6 series. Driving motor is designed to carry the cart loaded up to 2 kg on a vertical track and up to 10 kg on a horizontal track. FreeRide mode controls the speed of the cart with the use of a joystick and knobs. Recording mode is designed to record the movements of cart in order to ply it back later. Playback mode is designed to play the earlier memorized movements of the cart. Panorama mode is designed to take panoramic photos in both manual and automatic mode. cable release HKN-WS-1, HKN-WS-2, HKN-WS-3, HKN-WS-4, HKN-WS-5 or optionally HKN-WS-6 to trigger the shutter in the camera connected to the HKN-1 driving motor . Used in Animation, Time-Lapse and Panorama modes.